BRIOCHE BREAD RECIPE : My mother-in-law has a black-belt in bread making, especially when it comes to her famous Swiss tresse (braided pain brioché). But I am getting ahead of myself and if I am going to tell a story it’s best told from the beginning. Before I met Olivier’s family, breakfast for me was a non event. It was generally eaten quickly, on the run, out the door to work. So it will come as no surprise to you that a quick fruit, piece of toast or cereal, was all that was on the menu. My sad petit déjeuner habits were interrupted one Sunday, when I was invited to Olivier’s parents for breakfast. Sweet idea I thought – though someone really should have warned me not to eat for several days before, entering what I can only describe as, a Roman feast….. The appearance of roasted chestnuts, or marroni as they are called here, is the sign that Autumn has arrived in Switzerland. Dotted around the city of Geneva, are little wooden huts with steaming cauldrons of roasting chestnuts, wafting their sweet nutty scent into the cold air. This is a popular snack, which draws passersby into the lines of anxiously waiting people, for a paper cone of these toasty warm nuggets. NOTE : The slit in the shell is particularly important, otherwise imagine popcorn, but on a larger scale!! When I was a little girl, I found this out the hard way, after placing a tray of perfectly plum chestnuts into the oven, only to have them exploding half an hour later. Needless to say I learned my lesson. 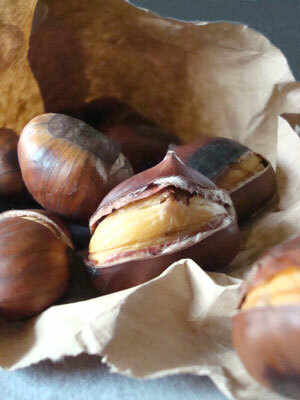 The taste of roasted chestnuts is tender and rather sweet. It gives you a warm and comforting feeling like being curled up in a thick blanket. So the next time you are strolling around Geneva or another Swiss city, from September through to December, I highly recommend treating yourself to few. A MAN OF 300 CHEESE: In my ever growing pursuit to support & promote our local specialty food shops & producers, those who sweat & toil to bring us superior quality, hand made produce direct from the source, I recently organised an interview with Dominique Ryser, current owner of the Fromagerie Bruand in Geneva. This was a great opportunity to meeting the man behind the cheese !!! I have often passed his store, and each time la gourmandise (love of food) takes over my senses – no longer am I the self composed, rational shopper with list – no, I have become a mouse… and a large drooling one at that. Completely mesmerized by his cheese display, I forget where I am walking, thinking only of the endless choices infront of me … salty Gruyere, soft tomme, nippy cheddar, crumbly sbrinz, creamy vacherin, velvety chevre…. and all the wonderful recipes that I could make with these. It is truly a sight to hold. HISTORY: The Fromagerie Bruand was started in 1982 by Mr. & Mrs Bruand, mother & step-father to Dominique Ryser. In 1998 they decided to turn their attention to other pastures, these being outside of Geneva, in the Swiss town of Ovronnaz – Valais. It was here that they opened the Chalet Gourmand, a fine food store offering cheeses (fromages), dried meats (charcuterie), wine (vinothéque) and other local specialty products. The silver lining of this move was that it left room for Dominique, a chef by trade, and his wife Carole to take over the family business that same year. 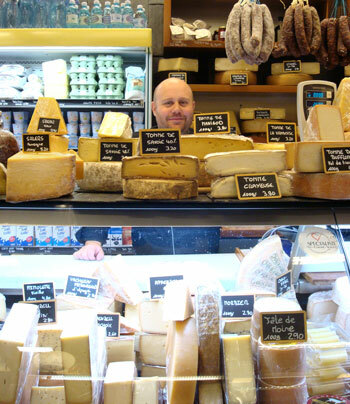 TODAY: Today they are the proud owners of this flourishing local cheese shop, located in the heart of Geneva’s most prominent food hall, Halle de Rive (the same location of my recent on Pain d’épice (spice bread). Their shop is well lay out and boast a superb collection of over 300 types of cheeses, of which 60% are Swiss, 30% European and 10% coming from abroad. 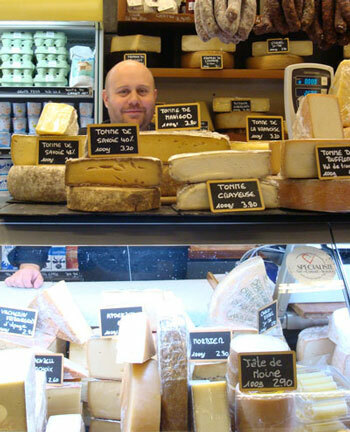 It comes as no surprise that with Dominique’s welcoming attitude, extensive knowledge of cheese and wide selection of quality produce, that the Fromagerie Bruand has build up a loyal clientele and a name of excellence in the industry. I was in Verbier skiing this past weekend – and as a foodies and bonne vivante, my trip would not have been complete without the ever wonderful, and not to be rushed delicatessen, bakery, and fromagerie tour. 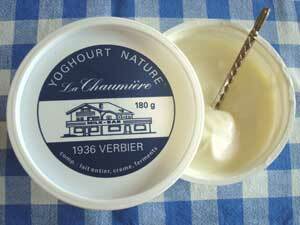 In my travels I came across a crèmerie located at the centre of town in a little chalet style shop called La Chaumière. It is here that they sell traditional regional delicacies including breads, caramels, jams / preserves, a wide selection of cheeses and a variety of national & international wines to accompany them.